Though North Korea denied it, uncertainties in the regime had grown with every day that Kim Jong-il was not seen in public. On 11 August 2008 the United States said it was not removing North Korea from its list of state sponsors of terrorism until Pyongyang produced an acceptable plan to verify its nuclear program. Kim Jong Il was last reportedly seen in public on 15-August 2008. On 24 August 2008 North Korea celebrated the 48th anniversary of General Secretary Kim Jong Il's start of the Songun [Army First] revolutionary leadership. On 26 August Pyongyang accused the United States of failing on its promise to remove North Korea from its list of state sponsors of terrorism and said it would immediately suspend disabling its nuclear facilities. On 11 October 2008, for the first time in 58 days, North Korean media showed images of leader Kim Jong Il appearing in public. Simultaneously, the United States reached an agreement with North Korea to resume implementation of the 6-party accord after the United States agreed to remove North Korea from the terrorist list after 20 years and nine months. There seemed to be some relationship between the public visibility of Kim Jong Il and negotiations over the North's nuclear weapons, but the connection is [not surprisingly] unclear. Possibly Kim Jong Il was taken ill in mid-August, leaving no one with the authority to deal with the United States. The leadership of the North would fall back on the Songun [Army First] ideology, which would rule out any reduction in the North's nuclear potential. When a compromise is reached, it is neccessary to provide a "proof of life" of the Leader in order to legitimize the deal. Or maybe Kim Jong Il saw some compromise coming, didn't want to be too closely associated with it, so he ducked out and planted rumors of his illness. The deal is struck, but the "proof of life" photos are so obviously fraudulent that his fingerprints are not firmly on the deal. Or something. In early September 2008, rumors about Kim Jong-Il's health began circulating following the North Korean leader's unusual absence from a parade marking the country's 60th anniversary. Kim Jong-Il was reported to be suffering from diabetes and heart disease. This speculation was further fueled by South Korea's Chosun Ilbo claiming that a team of five Chinese doctors had reportedly travelled to Pyongyang since late August. Kim's possible ill health further raised the question of North Korea's leadership succession and who would come to possibly replace him. South Korean media reported on 11 September 2008 that North Korean leader Kim Jong-il had undergone brain surgery and was in stable condition. Media reports said that Kim, 66, had been operated on by doctors believed to be from China and France after suffering a stroke in mid-August 2008. South Korea's largest daily, Chosun Ilbo, suggested that Kim could have partial paralysis on one side of his body, although South Korean officials seemed to be convinced that he remained in full control of the secretive communist state. South Korean presidential spokesman, Lee Dong-kwan, said Kim "did not seem to be in a serious condition." Concern over Kim's health arose when he failed to appear at a military parade in Pyongyang marking the country's 60th anniversary on 08 September 2008. "There are no problems," Kim Yong Nam, Pyongyang's No. 2 leader told Japan's Kyodo News agency. 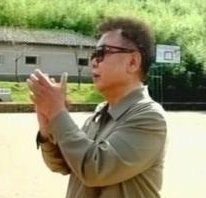 The eldest son of North Korean leader Kim Jong-il traveled to Paris to recruit a top brain surgeon and bring him home to treat his father, Japanese TV channel Fuji reported on 27 October 2008. Japanese media had been awash with reports on the reclusive communist leader's state of health in recent weeks, and have sparked angry denials from Pyongyang's state media. The channel showed footage of a man in a suit identified as the leader's son Kim Jong-nam leaving a hospital in Paris and getting into a car. He did not answer reporters' questions. Japanese Prime Minister Taro Aso said on 28 October that his government had secured information that Kim Jong-il was hospitalized, and that the situation was "not good." Prime Minister Taro Aso said that the North Korean leader is probably in hospital, but sufficiently healthy to maintain control over the country. North Korean leader Kim Jong-il is quickly recovering from an apparent stroke and is well enough to run the country, Seoul's Yonhap news agency quoted South Korea's intelligence chief as saying on 28 October 2008. "Although not completely fit, he appears well enough to perform his daily duties," National Intelligence Service Director Kim Sung-ho was quoted as saying. "We also believe Kim's eldest son made a trip to France last week," the intelligence chief added, concerning recent reports that Kim Jung-nam had visited Paris to hire a leading neurosurgeon to treat his father. Japanese Prime Minister Taro Aso said that Kim Jong-il was probably in hospital, but was unlikely to be completely incapacitated. "While his condition is not very good, it is unlikely that he can't make any decisions," he said citing, intelligence sources in various countries. The South Korean government said on 03 November that the latest photos released by North Korea of leader Kim Jong-il did not prove he is in good health. North Korean state media released several images over the weekend showing the "Dear Leader" purportedly attending a football match between two army teams, in an apparent attempt to quell speculation that he is in a critical state of health. "It is difficult to know Chairman Kim's health condition merely with still photos," Unification Ministry spokesman Kim Ho-Nyoun told reporters.